The Texas senator keeps blaming President Obama for failing to heed a warning that didn’t even occur before the attack. 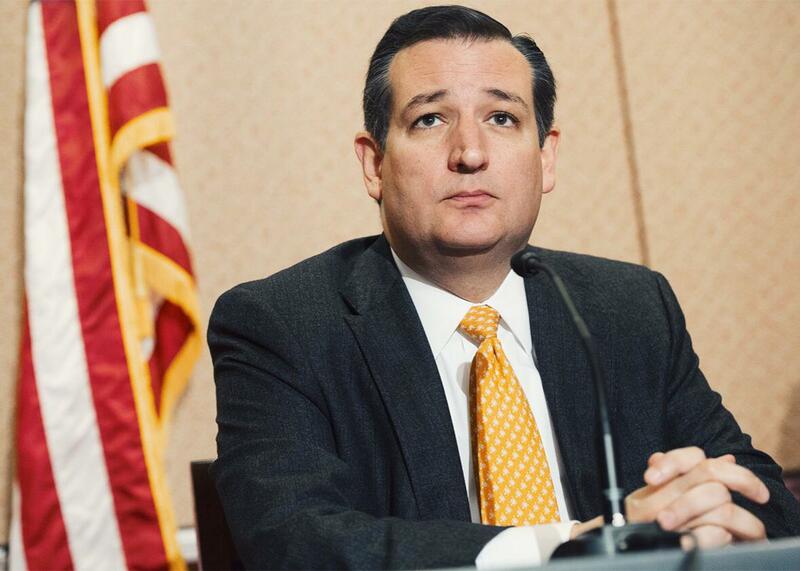 Sen. Ted Cruz has made a career of misrepresenting evidence, circumstances, statements, and people. Above, Cruz in Washington, D.C., on Dec. 8, 2015. We know that the man flew to Saudi Arabia. We know that he came in contact apparently with a number of individuals on the terror watch list. We know that the woman was apparently communicating [on] social media with ISIS terrorists, pledging her allegiance to ISIS. Let me ask a question: Why on earth did the Obama administration not know this ahead of time, and stop them before they carried out this terror attack? I’ll tell you why: because the so-called “communication” with ISIS wasn’t communication, and it didn’t occur until the attack was underway. So far we have no indication that these killers are part of an organized larger group or form part of a cell. There’s no indication that they are part of a network. … Second, there is nothing in our holdings about these two killers. I have seen reporting where folks have focused on reports that they were in contact, at least one of the killers was in contact with people who had been the subject of FBI investigations, either investigations that were closed or that were still open. I would urge you not to make too much of that. There were no contacts between either of the killers and subjects of our investigations that were of such significance that it raised these killers up on to our radar screen. Cruz might be forgiven for exaggerating Farook’s “contacts” with people who, at least theoretically, were under surveillance. What’s harder to forgive is his claim of “communication” between ISIS and Farook’s wife-accomplice, Tashfeen Malik. At the time Cruz spoke, there were no credible reports that Malik had communicated with ISIS prior to the attack. What had been reported was a Facebook post in which Malik pledged allegiance to—or, in other versions, expressed admiration for—the leader of ISIS. CNN reported that according to U.S. officials, Malik posted this statement “on an account with a different name” and that the post appeared “while the shooting was happening.” The New York Times, citing a Facebook spokesman, reported that the post appeared “at roughly the time of the shooting.” The Los Angeles Times, in its chronology of the attack, placed the massacre before the Facebook post. In other words, Cruz blamed Obama for failing to heed a warning that hadn’t yet occurred. And the Facebook post was a unilateral statement, not an exchange. For two days after the attack, nobody knew about it. Even ISIS seemed taken by surprise when it learned of the San Bernardino attack. You could give Cruz a pass for his initial mischaracterization of the Facebook post. But it’s hard to explain, in innocent terms, why he has repeated it many times since, despite clarifications from Comey and other FBI officials. Cruz has retold his version at a press gaggle on Dec. 4, another gaggle on Dec. 5, at a forum in Iowa on Dec. 5, on the Mike Gallagher radio show on Dec. 7, and in a Dec. 8 press conference to denounce Obama’s acceptance of Syrian refugees. Days after any honest, well-informed person would have abandoned this allegation, there are only two plausible explanations for Cruz’s persistent misrepresentation. One is that he still doesn’t know the facts and hasn’t taken the trouble to educate himself. The other is that he knows what he’s saying is false, but he doesn’t care. Either scenario is damning. Fortunately, Cruz is showing us this defect before we cast our ballots for president. Consider yourself warned.